Selfridges always has a luxury beauty advent calendar, as well as a more budget offering. This year is no exception. I told you about the more affordable Beauty Lovers Selection box here; it is still available worldwide at £70 from here, and makes a great Christmas gift. The luxury advent calendar is now available for purchase, and also ships worldwide. This year's edition is titled the Selfridges Glam Sparkle Advent Calendar. There are 24 products inside, and it costs £130. The contents are worth more than £300. 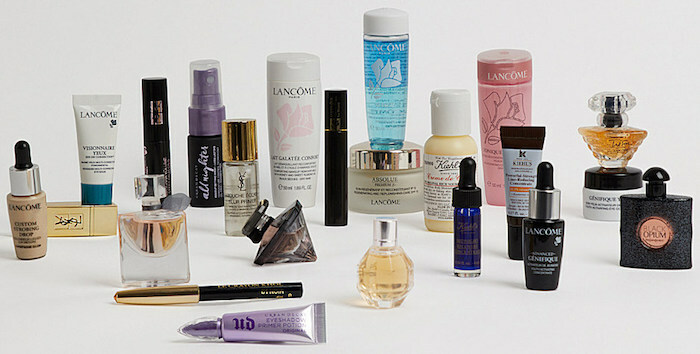 There are mini perfumes and makeup galore, all from high-end beauty brands. The original launch date was announced as 26 September, but this one appears to have been postponed by more than a week. Still, the contents are quite nice! You can see the contents of last year's Selfridges Luxe Advent Calendar here. Scroll down for the spoilers and contents of the Selfridges Glam Sparkle Luxe 24-Day Advent Calendar 2018. I love all those perfume minis, and that there's a whole YSL lippie in here. A red, ideal for the Holidays. Gosh, those perfume bottles! For those who live outside of the UK - Selfridges ships worldwide. They remove UK VAT for all international customers, and there's the option of prepaying customs duty (which I highly recommend, as it even helps speed up delivery); the amount for the two (VAT and duty) is almost the same, with only a few pounds' difference, so you don't have to worry about paying exorbitant additional charges. The Selfridges Glam Sparkle Luxe 24-Day Advent Calendar 2018 is available here, and costs £130. Get yours before it sells out!